21st January 2018 Robyn Stewart finished in the top ten on the final day of racing at the Tissot UCI Track Cycling World Cup today. Robyn made a strong World Cup debut in the Keirin, finishing ninth. 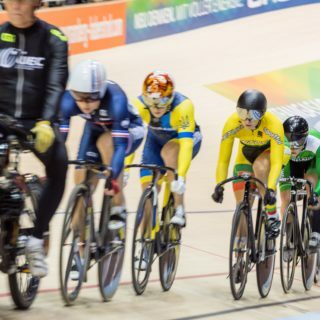 This is the final Track World Cup this season, and took place from the 19-21 January. In the Keirin Stewart progressed out of the first round repechage with a second place. Fourth in the next round saw her compete in the B Final, where she netted third, placing her ninth overall. The Keirin was won by Belgium’s Nicky Degrendele with Korea’s Hyelin Lee taking silver ahead of Ukraine’s Liubov Basova in bronze. This is the final major competition for the Irish team before the UCI Track Cycling World Championships in Apeldoorn at the end of February. Over the next couple of weeks, the number of places that Ireland has qualified for the World Championships will be announced.